Using the latest knowledge and pragmatic technology to take a patient from discomfort to a problem solved is Dr. Johnson's reward. "I enjoy finding unique solutions for each patient, listening until I understand, then taking it to a problem solved." 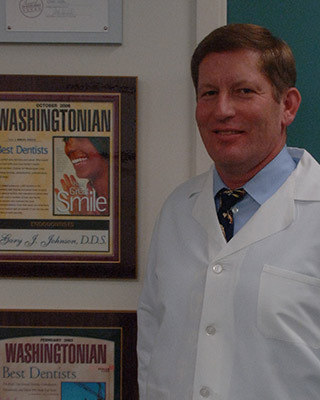 Dr. Johnson enjoys the reward of taking patients from that of discomfort to a problem solved. He looks at each patient and the treatment required as new and unique. He believes in the most conservative approach. "My enjoyment comes in understanding the patients most urgent pain or problem, then consulting with the patient in understandable terms and developing the best solution. The solution does not necessarily lead to Root Canal therapy. I am always evaluating the experience the patient is having while working to achieve the best result. Their smile and gratitude at the completion of Treatment." He has what Dr. Hasselgren, his Mentor, calls clinical imagination. "He is capable of extracting and extrapolating the knowledge from the literature and applying this together with common sense into a treatment plan. He is intelligent, very hard working and quite willing to learn. His peers, faculty, and staff appreciate him for his knowledge, pleasant manners, and excellent clinical skills. His excitement of life come through in all he does. He enjoys the beauty of planting, wildlife photography, landscaping and taking of the birdbaths, bird feeders around his home.